This past weekend, the 2018 Satchmo SummerFest presented by Chevron celebrated the life, legacy, and music of New Orleans’ native son, Louis Armstrong at the New Orleans Jazz Museum. Armstrong’s influence touched every aspect of the event, which brought together a diverse group of artists, culture-bearers, community leaders, and music-lovers from all walks of life. All present had one purpose: to celebrate the great man and his legacy. 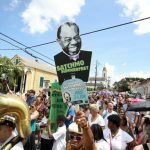 Recently named the “best thing to do in Louisiana this summer” by MSN.com, the 2018 Satchmo SummerFest delivered a showcase of the best of New Orleans’ talent, cuisine, and culture. Satchmo SummerFest presented by Chevron featured more than 40 acts, including eight debuts. 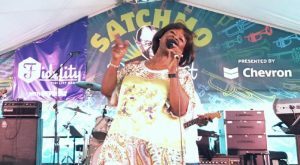 On Sunday, August 5, debuting Grammy® artist Irma Thomas dazzled thousands of fans at the Fidelity Bank Stage; though the beloved artist is famously known as the Soul Queen of New Orleans, jazz artist Armstrong’s inspiration was pivotal. “Mr. Armstrong was an influence on a lot of young children, including me. I never thought I would be in the business but then saw him as King Zulu when I was nine years old. That parade passed right in front of my house and left such an impression,” she said. The Roots of Music opened festival on Friday, August 3 with the Satchmo Sound-off on Esplanade Avenue. Joined by representatives from New Orleans’ Baby Doll community, the marching band completed their set with a Baby Doll-led secondline into the museum where Dr. Kim Vaz-Deville, author of The Baby Dolls: Breaking the Race and Gender Barriers of the New Orleans Mardi Gras and editor of the new book, Walking Raddy: The Baby Dolls of New Orleans hosted a panel on the Satchmo Legacy Stage. The momentum continued to build throughout the weekend, culminating in the Tricentennial Trumpet Mafia-led Trumpet Tribute presented by Popeyes, joined by surprise-special guests Nicolas Payton and Bill Summers. 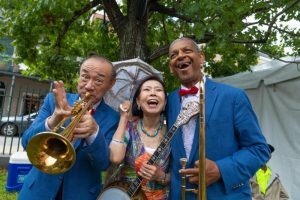 Other highlights of the weekend included: the sold-out August 2 Kickoff Party, An Evening with John Boutté, at the Omni Royal Orleans; the 2018 Spirit of Satchmo awards honoring Ashlin Parker, Bethany Bultman, and Ellis Marsalis; Yoshio Toyama’s Saturday, August 4 performance and recognition for his commitment to New Orleans; The Nayo Jones Experience debut on the GE Digital Stage; Sunday’s Jazz Mass at St. Augustine Catholic Church in Treme that drew worshipers from all over the world, including Mayor LaToya Cantrell (Councilmembers Jason Williams, Kristin Gisleson Palmer, and Cyndi Nguyen also attended the festival); the annual Satchmo Salute secondline with diverse mix of brass bands, baby dolls, social aid and pleasure clubs, and community leaders; Pops’ Playhouse powered by Entergy; the Abita Beer Garden; and three days of fascinating multi-media presentations on the Satchmo Legacy Stage. In addition, Satchmo SummerFest presented by Chevron introduced a new program that allowed attendees to recycle plastics, cans, and cardboard. Festival organizers are grateful for the support of generous sponsors Chevron,Omni Royal Orleans,Abita Brewing Company, Brown-Forman, Fidelity Bank, GE Digital, New Orleans Tourism Marketing Corporation, Jack Daniels,Sonoma-Cutrer, Korbel, Tequila Herradura,Finlandia,Pepsi, French Market Cold Brew Coffee,Luzianne Iced Tea, Friend of Fest, New Orleans Jazz and Heritage Foundation, OffBeat Magazine,Flamingo A Go-Go, The Bombay Club, Popeyes Louisiana Kitchen, JAX Brewery Parking Lots and the Berger Company, Windsor Court Hotel,Harrah’s New Orleans, New Orleans Jazz Museum,WWL-TV, French Market Corporation, New Orleans & Company, Joseph K. & Inez Eichenbaum Foundation, Entergy, Louisiana Division of the Arts,Touro, Take a Break Travel,Rhodes Funeral Home, Transdev, LASIK Vision Institute,Paddlewheeler Creole Queen, Ella Fitzgerald Charitable Foundation, National Park Service,The Fertel Foundation, Louisiana Seafood Promotion and Marketing Board, Bayou Rum, Reily Foods, NOLA.com-Times-Picayune, Downbeat Magazine, Louisiana Cookin’, Louisiana Cultural Vistas, Where Magazine, Vinyl District, iHeart New Orleans,Cumulus New Orleans, Data News Weekly, New Orleans Magazine,WBOK, WGSO, Biz New Orleans, WWNO 89.9 FM, and WWOZ 90.7 FM. Satchmo SummerFest, always falls on the weekend closest to Armstrong’s birthday – August 4. Satchmo SummerFest presented by Chevron is produced by French Quarter Festivals, Inc. (www.fqfi.org), the 501 (c) (3) nonprofit organization, which also produces French Quarter Festival presented by Chevron in April and Christmas New Orleans Style in December. French Quarter Festivals, Inc. promotes the Vieux Carré and the City of New Orleans through high quality special events and activities that showcase the culture and heritage of this unique city, contribute to the economic well-being of the community, and instill increased pride in the people of New Orleans.